Don’t confuse this with ‘Succession’, which is what happens when one tenant dies and the tenancy automatically transfers to the surviving husband, wife or civil partner (or in some cases, family member). This is about one tenant inheriting the tenancy under a will or (if the tenant did not leave a will) under the intestacy rules. We are still on mandatory grounds for possession here so the beneficiary of a will won’t be able to defend against a possession application but the landlord must apply quite promptly. The ground in the original act specifies ‘periodic tenancy’ but this was changed by the Localism Act s162(5). Now the ground can be used for all fixed term tenancies save any tenancies where a premium was paid (very rare) or if the tenancy has any value. Which means court proceedings, not merely service of a section 8 notice. 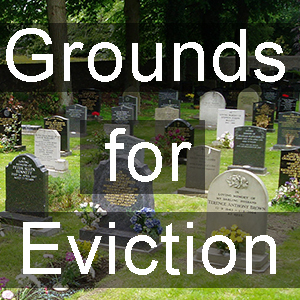 If court papers haven’t been filed within 12 months of the death then a landlord could lose. As it is a two month notice period, this means that the notice must be served well before the end of month 10. Helpfully the ground does state clearly that acceptance of rent from the beneficiary occupant whilst possession proceedings are being brought will not create a tenancy between the landlord and the beneficiary. Very little to it for advocates, other than to keep an eye on the time frame for proceedings. Also check to see that the landlord hasn’t provided anything in writing that the rent being taken during the period between the death and the possession order constitutes a new tenancy. Highly unlikely. Fixed term tenancies (there are a couple of exceptions) were included in this ground under an amendment introduced by s162(5) Localism Act 2011.